What does an SEO actually do? We had an interesting conversation during our meeting today. 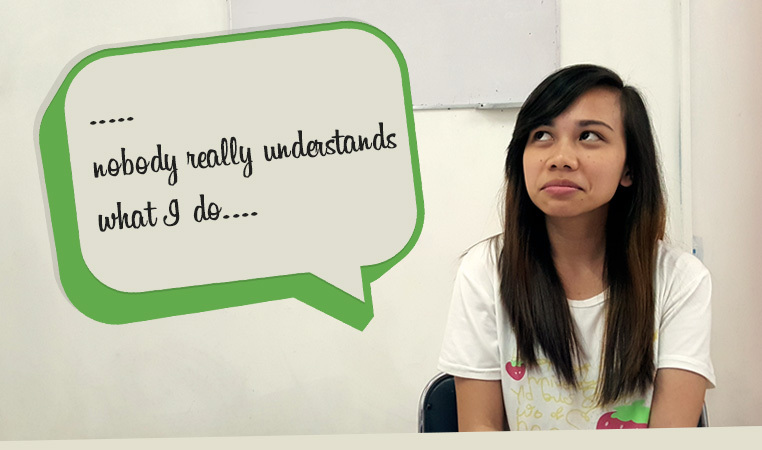 While thinking of making “cool” topics, Redkite Account Executive, Haziel from SEO said that it was getting hard for her to really explain what she does at work to her friends and to people who don’t know much about internet marketing. Nobody really understood her occupation! This was backed up by our Content Generation Specialist for SEO, Phoebe. So, this is a piece we would like to dedicate to those who work for the SEO industry. Let’s take a peek into what SEOs do so that Haziel and Phoebe can forward this link to anyone who wants to understand what they do a little better. SEO is Search Engine Optimization. It means optimizing webpages and websites to rank well in Google, Yahoo, and Bing (the major search engines). 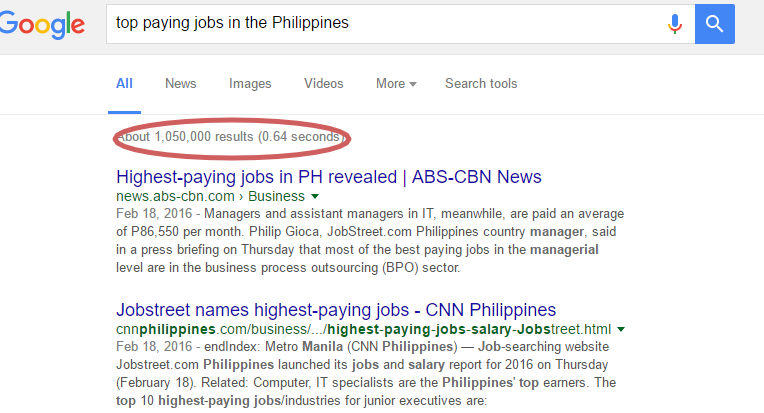 As you can see, for a particular search query “Top paying jobs in the Philippines,” there are millions of results. It can be quite an achievement to be on the top 10 (first page) and that is why businesses need to rank in search engines – otherwise, their sites will largely go unnoticed by Search Engine Users. So SEOs simply get sites from from the bottom of the pile to the top of the pile. Search engine experts need to be skilled at understanding ranking factors very well. They need to be very technical and creative at the same time and spend most of their time doing On-page SEO and Off-Page SEO. It is one of the fundamental jobs of the SEO to make sure that the site in question is crawled accurately by Search Engine bots. They want their focused and other content pages for the public to be crawled, indexed, and displayed in Google results. They do that by using tools in Google Search Console such as Sitemaps and Fetch. Some websites are just structured very poorly and it is the SEOs job to make recommendations on better navigation and site structure. Google loves to index pages that are grouped beautifully into relevant folders. That way, pages can be correctly categorized. However, this is often done if the site is being made from scratch. If the site has already existed for a while, then SEOs cannot do much here and will have to work with the site in the way that it is – unless the clients are willing to right the wrong information architecture of the site. Now that the pages are being indexed and displayed in Google, it is the work of the SEO to look for better ranking using their webpages. This is done by optimizing the content of the site including meta data. So they research, research, and research and then write, write and write! When writing content for the site, SEOs practice to keep a balance at all times between being creative and technical. (Creative) They write for the enjoyment of the audience 90% of the time, but they also need to remember that their content needs to be optimized for ranks so they allocate 10% of their writing to make sure that their pages are semantically in order with their SEO goals (Technical). All SEOs perform monthly or weekly audits per SEO campaign. You can think of audits to be similar to diagnosing a website – kind of like looking at symptoms, testing, and coming up with “treatments” to make a site/page perform its level best. When the On-page (section A above) is dealt with and the SEO is satisfied with their sites performance and the sites’ interaction with the Search Engines, it then becomes the task of the SEO to start creating links coming from other websites to the website in question. Links have to be carefully researched and validated to be of quality. They must also contain the correct information. When an SEO tries to “short-cut” this process, they end up making too many lousy links that is more of a hindrance to SEO than anything else. Once again, they research, research and research and then they build links. Without these links, Google would never know how to gauge the popularity of the sites. Google would not be able to favor to the sites that the SEO is trying to rank. Instead, Google would rank sites seem to be most relevant to their users. So this one is a huge deal. Although a part of a link building process, blogging serves many purposes. Blogs dynamically make sites more “beefed” up with relevant information for the user and the search engines. Blogs allow for the site to have continuous content updates and finally they are wonderful for sharing in social media. What good is a blog if no one knows about it? This is the part where SEOs and copywriters “re-invent” their blogs into smaller pieces of mini-content (Tumblr, WordPress, and other shorter-formatted blogs) and into micro-content (native social images with micro twitter sized posts). The same content will then be responsible for generating traffic via other content sharing sites and social sites. So this is what SEOs do on a daily basis, and since technology and how people consume content keep changing, SEOs have to keep honing their skills forever. They have to get better at mobile, image concepts and a whole lot more. It is a line of work that has a very bright future, but it is not without its challenges. 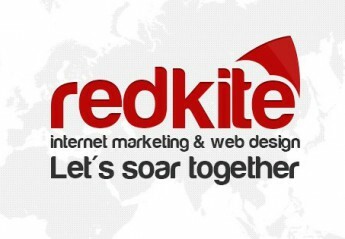 At Redkite, we have developed an SEO program that works for local and international clients. We love what we do and we are glad that now, you understand our process and what our staff actually do. Hope you enjoy this as much as I enjoyed writing it. Please share. Thanks!